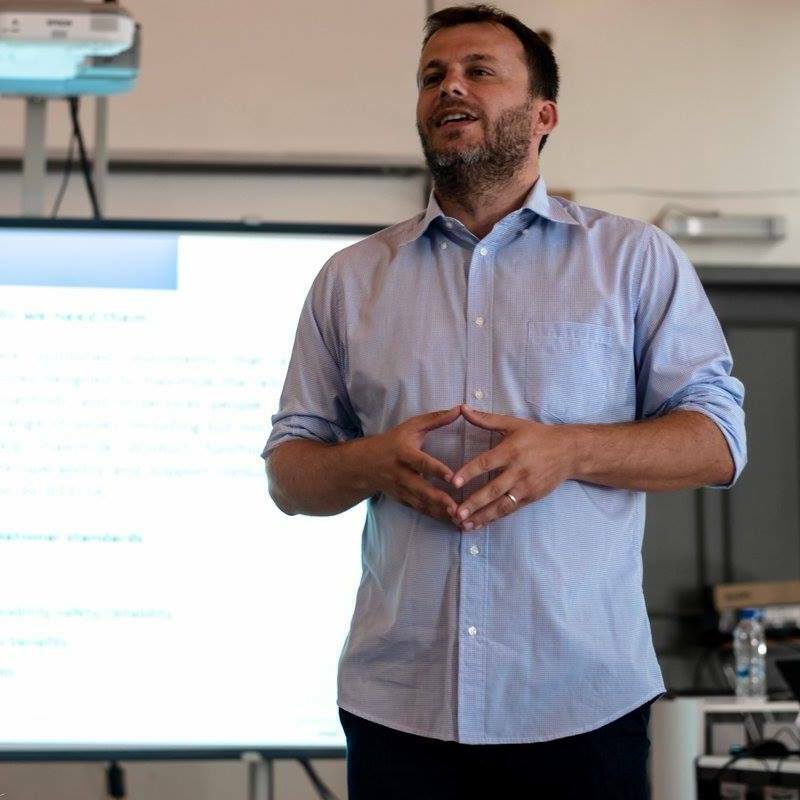 Dr. Chatzimisios serves as an Associate Professor, the Director of the Computing Systems, Security and Networks (CSSN) Research Lab and a Division Head in the Department of Informatics at the Alexander TEI of Thessaloniki (ATEITHE), Greece. Dr. Chatzimisios is involved in several standardization and IEEE activities serving as a Member of the Standards Development Board for the IEEE Communication Society (ComSoc), IEEE ComSoc Standards Program Development Board and IEEE ComSoC Education & Training Board as well as Vice Chair of the Technical Committee on Big Data (TSCBD) and Vice Chair of the IEEE ComSoc Technical Committee in Information Infrastructure and Networking (TCIIN). He is the editor/author of 8 books and more than 120 peer-reviewed papers and book chapters on the topics of performance evaluation and standardization activities of mobile/wireless communications, Internet of Things, Big Data and vehicular networking. His published research work has received more than 2800 citations by other researchers. Dr. Chatzimisios obtained his Ph.D. from Bournemouth University (UK) in 2005 and his B.Sc. from ATEITHE (Greece) in 2000. He is also the Departamental Erasmus+ Coordinator, a member of the Student Placement Committee and the Counselor/Founder of the IEEE Student Branch of the Department of Informatics (Alexander TEI of Thessaloniki). In the past, he has been a postdoctoral researcher under a research fellowship by the Greek State Scholarship Foundation (I.K.Y.). He was also employed as an adjunct Assistant Professor / Lecturer in University of Macedonia, Aristotle University of Thessaloniki, University of Western Macedonia, Technological Educational Institute of Larisa and Technological Educational Institute of Serres (Greece) where he was engaged with teaching and research on computer and telecommunications networks. He has also collaborated with the Hellenic Open University (EAP). In March 2005, he received the PhD degree in Electrical & Computer Engineering at the School of Design, Engineering and Computing (DEC) of the Bournemouth University, United Kingdom, discussing the doctoral thesis “Performance Modeling and Enhancement of Wireless Communication Protocols” under the supervision of Prof. Anthony Boucouvalas. In January 2000, he received the B.Sc degree in Informatics from the Technological Educational Institute (TEI) of Thessaloniki, Greece, discussing the thesis “Study and Presentation of the SNMP Protocol” under the supervision of Prof. Anthony Vafeiadis. Dr. Chatzimisios serves on the Editorial Boards of many international peer-reviewed journals such as IEEE Communications Surveys & Tutorials , Wiley Transactions on Emerging Telecommunications Technologies, formerly known as European Transactions on Telecommunications , Elsevier Computer Standards & Interfaces , ICaST Global Community Magazine , Springer Wireless Networks, Springer Telecommunication Systems , IGI International Journal of Wireless Networks and Broadband Technologies (IJWNBT) and on the Editorial Board of the International Journal of Computers and Applications . He is the Lead Guest Editor for several Special Issues such as "Next Generation Networks Service Management" of the Elsevier Computer Communications (with P. Bellavista, I. Habib and A. Vinel, 2010). In the past, he has served as Lead Guest Editor in the Special Issue on "Recent Advances in IEEE 802.11 WLANs: Protocols, Solutions and Future Directions" of the ACM/Springer Mobile Networks and Applications (MONET), (with Y. Xiao, I. Tinnirello, F. Granelli and E. S. Elmallah, 2009) and in the Special Issue on "Wireless Communication protocols: Performance Analysis and Optimizations" of the Mediterranean Journal of Computers and Networks (MEDJCN), (with V. Vitsas, 2006). Dr. Chatzimisios also serves as Organising Committee member and Technical Program Committee member of several IEEE/ACM international conferences. He is TPC Co-Chair of the IEEE International Symposium on Computers and Communications Conference (ISCC 2011), Kerkyra, June 2011, General Co-Chair of the 2nd International Conference on Mobile Lightweight Wireless Systems (MOBILIGHT 2010), Barcelona, May 2010, Publicity Co-Chair of the IEEE International Symposium on Computers and Communications Conference (ISCC 2010 and ISCC 2009) and TPC Co-Chair of the Multimedia Communications Symposium for CHINACOM 2010, August 2010. He is also the Workshop Chair of the 5th Workshop on multiMedia Applications over Wireless Networks (MediaWiN 2010), Riccione, June 2010 and the 1st IEEE International Workshop on Convergence of Heterogeneous Wireless Systems (CON-WIRE 2010), Zurich, August 2010. In the past, he was the Publication Co-Chair and the National Ambassador of Greece for the IEEE International Symposium on Personal, Indoor and Mobile Radio Communications (PIMRC 2008), that took place in Cannes-Palais de Festivals, September 2008. He has also served as Technical Program Co-Chair for the 1st International Conference on Mobile Lightweight Wireless Systems (MOBILIGHT 2009), that took place in Athens, May 2009 and as the Workshop Chair of the 3rd, 2nd and 1st Workshop on multiMedia Applications over Wireless Networks (MediaWiN 2008, 2007 and 2006), which were held in conjunction with the IEEE International Symposium on Computers and Communications Conference (ISCC 2008 and 2007) and the 12th European Wireless Conference (EW 2006), respectively. He was the Special Session Co-Chair in "QoS, Reliability and Performance Modelling", that took place in conjunction with the 6th International Symposium on Communication Systems, Networks and Digital Signal Processing (CSNDSP 2008), Graz, July 2008. Dr. Chatzimisios is a Member of Institute of Electrical & Electronic Engineers (IEEE), Association for Computing Machinery (ACM), IET and Hellenic Union of Informatics. T. Lagkas and P. Chatzimisios, "AWPP: A New Scheme for Wireless Access Control Proportional to Traffic Priority and Rate", EURASIP Journal on Wireless Communications and Networking (WCN), 2011. T. Lagkas, D. Stratogiannis and P. Chatzimisios, "Modelling and performance analysis of an alternative to IEEE 802.11e Hybrid Control Function", Springer Telecommunication Systems Journal, 2011. D. Takahashi, Y. Xiao, Y. Zhang, P. Chatzimisios and H.-H. Chen, “IEEE 802.11 User Fingerprinting and Its Applications”, accepted and to appear in Elsevier Computers and Mathematics with Applications, vol. 60, issue 2, pp. 307-318, July 2010. G. Baltoglou, E. Karapistoli and P. Chatzimisios, "IPTV on the Rise", published online in the ICaST magazine, October 2010. P. Raptis, V. Vitsas, P. Chatzimisios and K. Paparrizos, "Delay Jitter Analysis of 802.11 DCF", IET Electronic Letters, December 2007. P. Chatzimisios, A. C. Boucouvalas and V. Vitsas, "Performance analysis of the IEEE 802.11 MAC protocol for Wireless LANs", Wiley International Journal of Communication Systems, vol. 18, issue 6, pp.545-569, June 2005. P. Huang, P. Chatzimisios and A.C. Boucouvalas, "Optimising IrDA throughput by including processing time with physical layer consideration", Optical Society of America (OSA) Journal of Optical Networking (JON), vol. 4, no. 6, pp. 323-331, June 2005. P. Chatzimisios and A. C. Boucouvalas, "Packet Delay Analysis of the Advanced Infrared (AIr) CSMA/CA MAC Protocol in Optical Wireless LANs", Special Issue in Indoor Optical Wireless Communication Systems and Networks, Wiley International Journal of Communication Systems, vol. 18, issue 3, pp.307-331, March 2005. P. Chatzimisios, A. C. Boucouvalas and V. Vitsas, "IEEE 802.11 Wireless LANs: Performance Analysis And Protocol Refinement", EURASIP Journal on Wireless Communications and Networking, vol. 2, issue 1, pp. 67-78, March 2005. P. Chatzimisios, A. C. Boucouvalas and V. Vitsas, "Effectiveness of the RTS/CTS Handshake in IEEE 802.11a Wireless LANs", IEE Electronic Letters, vol. 40, no. 14, pp.915-916, 8th July 2004. P. Chatzimisios, A. C. Boucouvalas and V. Vitsas, "Influence of BER on the Performance of IEEE 802.11 DCF", IEE Electronic Letters, vol. 39, no. 23, pp.1687-1689, 13th Nov. 2003. Ming Yang, Mingsheng Gao, Chuan Heng Foh, Jianfei Cai and Periklis Chatzimisios, "DC-MAC: A Data-centric Multi-hop MAC protocol for Underwater Acoustic Sensor Networks",in the 16th IEEE Symposium on Computers and Communications (ISCC 2011), Kerkyra, Greece. Georgios Baltoglou, Eirini Karapistoli and Periklis Chatzimisios, "Real-World IPTV Network Measurements", in the 16th IEEE Symposium on Computers and Communications (ISCC 2011), Kerkyra, Greece. Dimitrios J. Vergados, Aggeliki Sgora, Dimitrios D. Vergados and Periklis Chatzimisios, "Joint Per-Flow Scheduling and Routing in Wireless Multihop Networks", in the 16th IEEE Symposium on Computers and Communications (ISCC 2011), Kerkyra, Greece. T. Lagkas and P. Chatzimisios, "Performance and fairness analysis of a QoS supportive MAC protocol for Wireless LANs", accepted in IEEE International Conference on Communications (ICC 2011), Kyoto, Japan, 5-9 June 2011. G.Tsiropoulos, D. Stratogiannis, P. Cottis, T. Lagkas and P. Chatzimisios, "Adaptive Resource Allocation and Dynamic Call Admission Control in Wireless Networks", in Proceedings of the Workshop on Mobile Computing and Emerging Communication Networks (MCECN 2010) held in conjunction with the IEEE Globecom 2010, pp. 1217-1221, Miami, USA, 6-10 December 2010. P. Sarigiannidis, M. Louta and P. Chatzimisios, "A novel fair mapping scheme for IEEE 802.16 downlink sub-frame", in Proceedings of the International Congress on Ultra Modern Telecommunications (ICUMT 2010), Moscow, Russia, 18-20 October 2010. A. Sgora, D. D. Vergados and P. Chatzimisios, "An Access Network Selection Algorithm for Heterogeneous Wireless Environments", in Proceedings of the IEEE International Symposium on Computers and Communications Conference (ISCC 2010), Riccione, Italy, June 2010. C. Brouzioutis, V. Vitsas and P. Chatzimisios, "Studying the Impact of Data Traffic on Voice Capacity in IEEE 802.11 WLANs", in Proceedings of the IEEE International Communications Conference (ICC 2010), Cape Town, South Africa, May 2010. A. Sgora, P. Chatzimisios and D. D. Vergados, "Access Network Selection in a Heterogeneous Environment using the AHP and fuzzy TOPSIS methods", in Proceedings of the 2nd International Conference on Mobile Lightweight Wireless Systems (MOBILIGHT 2010), Barcelona, Spain, May 2010. A. Sgora, D. D. Vergados and P. Chatzimisios, "IEEE 802.11s Wireless Mesh networks: Challenges and Perspectives", in Proceedings of the 1st International Conference on Mobile Lightweight Wireless Systems (MOBILIGHT 2009), Athens, Greece,18-20 May 2009. P. Chatzimisios, P. Raptis, V. Vitsas and K. Paparrizos, "Admission Control for VoIP and Data Traffic in IEEE 802.11 WLANs, Invited Paper, in Proceedings of the First International Workshop on MOdelling and DEsign of wireless mesh NETworks (MODENETs 2008), Athens, Greece, October 2008. P. Raptis, A. Banchs, V. Vitsas, K. Paparrizos and P. Chatzimisios, "Delay Distribution Analysis of the RTS/CTS mechanism of IEEE 802.11", accepted in the 31st IEEE Conference on Local Computer Networks (LCN 2006), Tampa, Florida, U.S.A., 14-17 November 2006. P. Chatzimisios, V. Vitsas and A. C. Boucouvalas, "Revisit of fading channel characteristics in IEEE 802.11 WLANs: independent and burst transmission errors", accepted in the IEEE International Symposium on Personal, Indoor and Mobile Radio Communications (PIMRC 2006), Helsinki, Finland, 11-14 September 2006. D. S. Amanatiadis, V. Vitsas, A. Manitsaris, I. Mavridis, P. Chatzimisios and A.C. Boucouvalas, "Voice capacity of IEEE 802.11b WLANs", accepted in the International Conference on Communication Systems, Networks and Digital Processing (CSNDSP 2006), Patras, Greece, 19-21 July 2006. P. Chatzimisios, V. Vitsas and A. C. Boucouvalas, "DIDD backoff scheme: An enhancement to IEEE 802.11 DCF under burst transmission errors", accepted (to appear) in Proceedings of the IEEE Sarnoff 2006 Symposium, Nassau Inn in Princeton, NJ, USA, 27-28 March 2006. P. Chatzimisios, V. Vitsas and A. C. Boucouvalas, "On improving performance for IEEE 802.11 Wireless LANs under congested and error-prone environments", accepted (to appear) in Proceedings of the International Conference on Internet and Multimedia Systems and Applications (EuroIMSA 2006), Innsbruck, Austria, 13-15 February 2006. P. Chatzimisios, V. Vitsas, A. C. Boucouvalas, D. Kleftouris and M. Tsoulfa, "Packet delay performance comparison of the IEEE 802.11 and IrDA AIr CSMA/CA protocols in high-speed Wireless LANs", accepted (to appear) in Proceedings of the International Conference on Internet and Multimedia Systems and Applications (EuroIMSA 2006), Innsbruck, Austria, 13-15 February 2006. P. Raptis, V. Vitsas, K. Paparrizos, P. Chatzimisios A. C. Boucouvalas and P. Adamidis, "Packet Delay Modeling of IEEE 802.11 Wireless LANs", invited paper, in Proceedings of the 2nd International Conference on Cybernetics and Information Technologies, Systems and Applications (CITSA 2005), vol. I, pp. 71-76, Orlando, Florida, USA, 14-17 July 2005. P. Chatzimisios, A. C. Boucouvalas, V. Vitsas, A. Vafiadis, A. Economidis and P. Huang, "A simple and effective backoff scheme for the IEEE 802.11 MAC protocol", invited paper, in Proceedings of the 2nd International Conference on Cybernetics and Information Technologies, Systems and Applications (CITSA 2005), vol. I, pp. 48-53, Orlando, Florida, USA, 14-17 July 2005. P. Raptis, V. Vitsas, K. Paparrizos, P. Chatzimisios and A. C. Boucouvalas, "Packet Delay Distribution of the IEEE 802.11 Distributed Coordination Function", in Proceedings of the IEEE International Symposium on a World of Wireless, Mobile and Multimedia Networks (WoWMoM 2005), pp. 299-304, Taormina, Italy, 13 – 16 June 2005. P. Chatzimisios, A.C. Boucouvalas and V. Vitsas, "Optimisation of RTS/CTS handshake in IEEE 802.11 Wireless LANs for maximum performance", in Proceedings of the IEEE Global Telecommunications Conference (Globecom 2004) Workshops, pp. 270-275, Dallas Texas, USA, 29 Nov.- 3 Dec. 2004. V. Vitsas, P. Chatzimisios, A.C. Boucouvalas, P. Raptis, K. Paparrizos and D. Kleftouris, "Enhancing performance of the IEEE 802.11 Distributed Coordination Function via packet bursting", invited paper, in Proceedings of the IEEE Global Telecommunications Conference (Globecom 2004) Workshops, pp. 245-252, Dallas, Texas, USA, 29 Nov.- 3 Dec. 2004. P. Chatzimisios, A.C. Boucouvalas and V. Vitsas, "Performance Analysis of IEEE 802.11 DCF in the Presence of Transmission Errors", in Proceedings of the ΙΕΕΕ International Conference on Communications (ICC 2004), vol. 7, pp. 3854 – 3858,Paris, France, 20-24 June 2004. P. Chatzimisios, A.C. Boucouvalas and V. Vitsas, "IEEE 802.11 Packet Delay – A Finite Retry Limit Analysis", in Proceedings of the IEEE Global Telecommunications Conference (Globecom 2003), pp. 950-954, San Francisco, USA, 1-5 Dec. 2003. P. Chatzimisios, V. Vitsas and A.C. Boucouvalas, "Throughput and Delay Analysis of IEEE 802.11 Protocol", in Proceedings of the 5th IEEE International Workshop on Networked Appliances (IWNA 2002), pp. 168-174, Liverpool, UK, 30-31 Oct. 2002. P. Chatzimisios and A. C. Boucouvalas, "Optimisation of IrLAP IrDA Protocol Including Processor Speed", in Proceedings of the 3rd Annual Convergence of Telecommunications, Networking and Broadcasting Conference (PGNET 2002), pp. 298-303, Liverpool, UK, 17-18 June 2002.